(Minghui.org) Practitioners of Falun Dafa (also known as Falun Gong) around the world have held public events for more than a decade to raise public awareness of the brutal persecution in China, calling for help to end it and telling people about the ancient Chinese cultivation practice. This newsletter covers 12 events that took place in the United States, Europe, and New Zealand in the last few weeks. At the start of the fall semester, college campuses hold orientation events, an ideal opportunity for Falun Gong practitioners in New York City to introduce the practice to students and faculty. At Columbia University, 300 student organizations set up booths from Low Plaza to Butler Library on September 9. Practitioners gave out information on their free workshops, which interested many students. Several Chinese students were happy to run into Falun Gong on campus and learn what Falun Gong really is. Students and faculty members sign up for a free Falun Gong workshop. Chinese students were dismayed to learn the real story behind the persecution of Falun Gong in China. A similar event was held at Queens Community College on August 31. “Friends of Falun Gong” was one of the 50 organizations at the orientation. More than 30 students registered for the free workshop. Many more signed the petition to condemn the persecution of Falun Gong in China. Falun Gong booth at the orientation on the campus of Queens Community College. Practitioners tell their classmates about Falun Gong. Practitioners’ activities in New York were not limited to college campuses. On September 11, they participated in the 20-block-long street fair on Third Avenue in Manhattan. Twenty-five people signed up for the free workshop. Practitioners in St. Paul, Minnesota, participated in a much larger fair—the 153rd State Fair—from August 25 to September 5. This is one of the nation’s largest state fairs by average daily attendance. 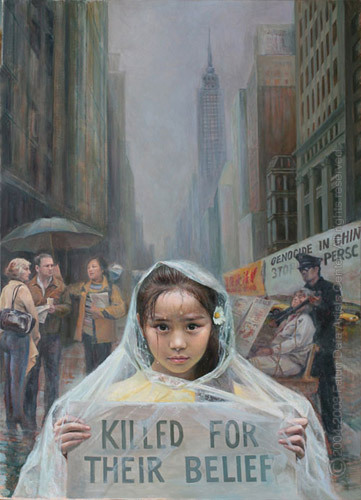 The Minnesota practitioners’ primary goal was to raise public awareness of the persecution of Falun Gong, especially the state-sanctioned organ harvesting from living practitioners in China and called for help to end it. Their effort was very successful. During the 12 days of the fair, they collected nearly 16,000 signatures on a petition that condemns the persecution. People sign the petition to support Falun Gong’s peaceful resistance. After signing the petition, many people came back with their family members the next day to get them to sign, too. Several school teachers said they would tell their students about this human rights violation in China, and others asked for more materials for their students. Quite a few Chinese also bravely signed the petition despite the suppression in their home country. Practitioners also demonstrated the exercises several times on the stage. A few people in the audience told practitioners that they had already started reading Falun Gong books and were glad to have a chance to learn the exercises in person. Demonstrating the exercises at the Minnesota State Fair. Practitioners’ peaceful resistance activity in Reșița, Romania, on September 11 was strongly supported by the locals. Many people signed the petition to condemn forced organ harvesting. The event also caught the attention of the local media. Several reporters interviewed practitioners and said they would cover the story. Matei, a reporter with Ziar online de Caras-Severin newspaper, wanted to write an in-depth article on the persecution. Cristina and Cosmin, reporters from Radio Romania Reșița, were horrified to learn about the brutal persecution. They interviewed practitioners and took photos in front of their display board to show their support. Cristina and Cosmin support Falun Gong. Thousands of visitors to the British Museum, one of the most famous tourist destinations in the world, have seen Falun Gong events, which have been held there every Saturday for the last two years. And thousands of them have signed the petition, calling for an end to the persecution. Tourists study the practitioners’ display board and learn about Falun Gong. One of the practitioner’s sincerest desire is to tell her Chinese compatriots about the persecution and persuade them to withdraw their memberships in the Party and condemn its crimes. Practitioners are glad to see that more and more Chinese are willing to talk to them and learn about this practice that is banned in China. The Chinese tourists were happy to have a chance to learn the facts that have been censored in China for too long. Many of them decided to quit the communist party with practitioners’ help. Groups of Chinese tourists talk to practitioners and learn the real story of Falun Gong. The Eiffel Tower is another famous tourist spot where practitioners introduce Falun Gong and expose the persecution. Falun Gong exercise demonstration in front of the Eiffel Tower on September 11. Tourists study Falun Gong materials and sign the petition on September 11. Many tourists were appalled to learn about forced organ harvesting. Although Balleinger said she was familiar with the beautiful Chinese culture, she had no idea that such a horrible thing has been happening there. “Even Hitler didn’t harvest people’s organs for profit,” she said. Giovani Stissi also compared the organ harvesting to Nazi’s genocide in World War II. “I’ve read many things about the Nazis, and I even visited Dachau concentration camp, but I was not as shocked as I am now. I am speechless. It is so sad. The murderers will have to pay sooner or later. On September 10 and 11, practitioners in Moscow participated in the celebration of the 869th birthday of the capital of Russia, and collected signatures to protest forced organ harvesting in China. A young boy holds a paper lotus flower made by practitioners and his mother holds Falun Gong literature. Practitioners in Saxony, Germany, were invited to one of the largest community events—Saxony Day—held in Limbach Oberfrohna on the first weekend of September. Practitioners demonstrated the exercises. Among the 170 groups, the Tian Guo Marching Band, consisting of practitioners from several European countries, played in the parade at the opening ceremony. It was the third time the band has performed at this festival, which attracts more than 300,000 people from the neighboring countries. Practitioners’ performances, including the “celestial maidens” dance, the exercise demonstration on the beautifully-decorated float, and the band’s performance, are warmly welcomed by the spectators every year. Last year, the governor of Saxony, Stanislaw Tillich, had high praise for the band, commenting how excellent they were several times. Two events were held in Sweden last week. The first one was in front of City Hall in Stockholm. Many local residents and tourists saw practitioners’ exercise demonstration and read their materials. Some of them also started to learn the exercises. Many Chinese tourists were surprised to see Falun Gong. Some stopped by and encouraged practitioners to keep up the good work. In Gavle, 100 miles northwest of Stockholm, practitioners demonstrated the exercises and collected signatures to condemn the persecution. Many people, including some Chinese, signed the petition to support Falun Gong. The Falun Gong event in downtown Gavle, Sweden, on September 9. On the other side of the world, practitioners dressed as traditional Chinese celestial maidens won the “People’s Choice, Best Dressed Award” and 500 New Zealand dollars at the annual harvest festival parade in Hastings, New Zealand, on September 10. (Minghui.org) More than half of Members of the European Parliament (MEP) have co-signed Written Declaration (2016/WD48) as of July 12. The written declaration requires the European Parliament to take action to stop state-sanctioned organ harvesting in China. Falun Gong practitioners from 13 European countries held rallies in front of the EU Building in Strasbourg, France from July 6 – 8, raising awareness of and expressing support for for WD48. The written declaration was initiated by 12 MEPs. Arne Gericke, a MEP from Germany who is one of the initiators of WD48, believes that stopping the forced organ harvesting is not only important to Chinese people, but also to Europeans. Gericke said that the EP should pass laws to forbid medical insurance from covering organ transplants that are involved in the illegal organ trade. Hans-Olaf Henkel, a MEP from Germany, said although he knew well about the organ harvesting and had written to Chinese organizations to express his concern, the newly discovered evidence of organ harvesting still shocked him. He said that we should try the best to stop it. Many lawmakers came to up to the group of practitioners over the three days and encouraged them to keep up the peaceful resistance. Julie Ward, MEP from U.K. said that we should clearly make our voice. Organ harvesting should not be happening in the 21st century. Gerald Batten, MEP from U.K., talked to practitioners for 30 minutes, and listened to two practitioners tell their own experiences of torture in China. Batten said he is glad to support this declaration. It is his responsibility, he said. He also praised Falun Gong practitioners for their courage, which deeply moves him. He believes that practitioners will keep up the peaceful resistance till they win. Tunne Kelam, MEP from Estonia and a long-term supporter of Falun Gong, said the results from the independent investigation on organ harvesting have made a deep impact. People should know what they don’t, he said. Kelam said the European governments have not warned their citizens, and people don’t know that Chinese people are being killed for organs. It is Europe’s responsibility, he said. Seb Dance said that many people, including the lawmakers, have witnessed practitioners’ activities, which raise the public awareness. It is remarkable, he said. Jonathan Tessier signed the petition, and hoped that EU will take action soon. Jauffrray, a security guard of the EU Building, heard about the organ harvesting from his coworkers. He read the materials, and came to practitioners for more information. “Everybody should have freedom, physically and spiritually,” Jauffray signed the petition. Matthis Halldorsson, a physician from Iceland, signed the petition. “This is murder,” he condemned the organ harvesting. Tue Lundkvist, a Danish lawyer, said everybody should support the resistance. (Minghui.org) Three independent investigators from Canada and the United States testified at a hearing on the state-sanctioned organ harvesting of prisoners of conscience in China, held by the European Parliament on June 29, 2016. Canadian human right lawyer David Matas, Canadian former diplomat David Kilgour, and American reporter Ethan Gutmann presented the results from the latest investigations at the hearing. Based on the data from hundreds of hospitals in China since 2000, the investigators estimated that between 60,000 to 100,000 organ transplant surgeries are being conducted in China every year. The hearing was initiated by Member of European Parliament (MEP) Louis Michel. David Matas, who has been devoted to the investigations of the forced organ harvesting in China for years, called on the EU to do what they can to stop this atrocity. According to Matas, the latest investigation concluded that the Chinese Communist Party has involved the entire nation in the mass killing. The majority of the victims are Falun Gong practitioners, and the rest include Uyghurs, Tibetans, and Christians. The communist regime is harvesting their organs for profit. Ethan Gutmann, the author of The Slaughter, a book about the forced organ harvesting, said at the hearing that the EU passed a resolution in December 2013 urging China to stop the organ harvesting, but the EU should conduct further independent investigations. It is abnormal to kill one for saving another and Europe needs to take action, he said. Gutmann said that the action must obtain support from the public. He suggested that the EU should make laws, as Taiwan did, to forbid traveling to China for organ transplants. MEP Peter Liese from Germany believes that it is the EU’s responsibility to stop forced organ harvesting in China. He called on his colleagues not to wait and to exert pressure on Beijing. He said that the MEP must make their voices heard, so that the MEP committees will listen. Tomas Zdechovsky from Czech said his grandfather experienced the terrors of the communist party. He called upon the lawmakers not to give up the fight against tyranny. He said, if we want to change something, we must take action, and if we believe in success, we will succeed. If you fall asleep in democracy, then you could wake up in a dictatorship, he said. Tunne Kelam, one of the sponsors of the EU resolution on organ harvesting, said this is important to everybody, not just to the MEPs. Such a crime can only happen under a dictatorship. He said it is the EU’s responsibility to stop it, because many Europeans may go to China for organ transplants. There is no excuse for this crime against humanity, Kelam said, and he called for independent investigations by the EP. He said they cannot ignore this crime because of economic relationship with China and should take it as their responsibility to stop this atrocity. Miss World Canada 2015 Anastasia Lin also testified at the hearing. She briefly introduced Falun Gong as being distinct from tai chi or yoga; rather, it is an ancient cultivation practice and focuses on improving one’s heart or character. Its practitioners follow the principles of Truthfulness-Compassion-Forbearance and try to be better people, she said. About 100 million Chinese joined the practice before 1999, at which point the Communist Party became threatened by Falun Gong’s popularity and launched its brutal suppression of the group. (Minghui.org) On the first weekend of June, Falun Gong practitioners participated in activities in several cities across Europe, introducing this ancient Chinese cultivation practice to the public, and exposing the brutal persecution it faces in China. Practitioners were invited to teach the exercises at a music festival held in Edinburgh, Scotland on June 4 and 5. The organizers of the festival allotted an hour for the free Falun Gong workshop. One practitioner gave detailed explanations while the two others demonstrated the movements. Many people joined the exercises, and asked for contact information for local practice sites. Learning the Falun Gong exercises. An Italian gentleman (with the stick) learned Falun Gong many years ago, but stopped for various reasons. He was glad to run into practitioners today so that he could resume practicing. Besides teaching the exercises, practitioners also told the attendees about the persecution. Many people were shocked by the brutality and signed a petition to condemn it. In two days, practitioners collected 1059 signatures. A couple from Venezuela chatted with practitioners for a long time. “We must help to stop the brutalities,” they said as they signed the petition. An American-born Chinese boy was shocked by the persecution. He and his parents never heard about the persecution of Falun Gong in China. He said he would learn more and tell his parents about it. In Augsburg, Germany, practitioners held a Falun Gong Information Day on June 4. The theme was collecting signatures on a petition that calls for an end to the persecution. People sign petition in support of Falun Gong. A Romanian family was shocked by the persecution. Both husband and wife signed the petition. Weiss and his mother sign the petition, and thanked practitioners for their efforts to tell people what is happening in China. Mr. Naumman said the persecution is a huge mistake, and that the world community should focus on human rights as well as economic development. In Bielefeld, Germany, local practitioners joined the 20th Multi-Cultural Festival held in Ravensberger Park on June 4. People learn about Falun Gong at Multi-Cultural Festival in Bielefeld, Germany. Many festival attendees were attracted to the peaceful exercises. An elementary school teacher said she wanted to learn, believing its just what she has been looking for. “My students need this. They cannot calm down. Can I invite you to my class to demonstrate the exercises for them?” she asked. One gentleman felt a strong energy field around the practitioners. He was shocked by the persecution, and signed the petition. “I am lucky and honored to be the first one today to sign the petition,” he said. Practitioners also gathered petition signatures downtown that same day. Many people said they had seen a documentary on television that reveals the state-sanctioned organ harvesting from Falun Gong practitioners in China. They were glad to have to have the chance to voice their support for Falun Gong today. A Chinese gentleman who has lived in Germany for more than 10 years thanked practitioners for their efforts. “Many Chinese people have been brainwashed by the Party. You have done a great job of telling people the truth. Keep it up,” he said as he signed the petition. Practitioners from Stockholm, Sweden, have held group exercises in a local park Humlegården everyday Sunday morning for almost 20 years. On sunny days, many people join them and learn the movements. Group exercises in Stockholm’s Humlegården Park. Practitioners offer Falun Gong flyers in multiple languages, including Swedish, English, German, and Spanish. Many people stop by to learn more. (Minghui.org) Groups of Chinese tourists in Europe during the winter break saw Falun Gong booths in multiple countries, and many were glad to have a chance to quit the Chinese Communist Party with help from Falun Gong practitioners. Chinese tourists pass by the Falun Gong booth in front of the Eiffel Tower. Practitioner Ms. Jun often came to the booth in front of the Eiffel Tower, to tell Chinese visitors the facts about Falun Gong, and advise them to recognize the evil nature of the Communist Party. The entire family quit the Party and its associated organizations with Ms. Jun’s help. She gave them a computer software to circumvent China’s Internet firewall, so that they can learn more about Falun Gong. Chinese tourists view Falun Gong materials in front of the Cologne Cathedral in Germany. One day a group of Chinese tourists passed by the Falun Gong booth in front of the Cologne Cathedral in Germany. Most of them scowled at practitioners, and refused to take the Falun Gong materials. The Chinese tourists listened quietly. The lady who asked if practitioners were paid was deeply touched. She kept saying “Thank you for telling us this.” Before they left, almost all of them quit the Party. (Minghui.org) Five European leaders held up banners in their office on World Human Rights Day, calling for Jiang Zemin to be brought to justice for his role in the persecution of Falun Gong in China. Supporting the recent wave of lawsuits filed against Jiang by nearly 200,000 Falun Gong practitioners, the European politicians called upon the Chinese legal system to investigate the crimes against humanity that the former Chinese Communist Party leader has committed in the 16-year-long persecution, especially the state-sanctioned, involuntary harvesting of organs from Falun Gong practitioners. Martin Patzelt put this picture on his personal website, telling the public that he has signed the petition to support the lawsuits being filed against Jiang. Martin Patzelt, a member of the German Parliament, said on his personal website that if the Chinese government is incapable or unwilling to investigate the crimes that Jiang has committed, the International Court in the Hague will step in. Early in April, Patzelt said on his website before a trip to China that he would ask the Chinese government why it persecutes Falun Gong, a group of people who have had only a positive impact on China. Prof. Dr. Klaus Buchner called for more support for the lawsuits against Jiang. Prof. Dr. Klaus Buchner, a member of the human rights committee of the European Parliament (EP) from Germany, has condemned the Chinese regime on his Facebook account for the persecution of Falun Gong lawyers in Heilongjiang Province. He has also written to the Chinese ambassador in Germany and European Union, requesting the release of jailed practitioners in Heilongjiang. Prof. Dr. Buchner issued a statement on July 15, 2015, criticizing human rights violations in China after well-known Chinese human rights lawyer Wang Yu was arrested. “We see the commitment of the lawyers for the persecuted Falun Gong practitioners in China. That’s why in February of this year, more than 20 MEPs from several European countries signed a letter to the Chinese Ambassador to Germany and local Chinese authorities, in support of the lawyers pursuing the release of their clients,” wrote Buchner. Dr. Cornelia Ernst, a member of the EP from Germany, supports the lawsuits against Jiang. Dr. Cornelia Ernst, a member of the EP from Germany, wrote to Chinese procurator-general Cao Jianming on July 20, 2015, urging Cao to investigate Jiang Zemin’s crimes in the harvesting of organs. The letter was co-signed by several EP members and sent to the ambassadors in Germany and the European Union, the United Nations special rapporteurs on the issues of torture and freedom of belief, the procurator in the Hague International Court, and several European politicians. In the letter, the EP members expressed the belief that Falun Gong practitioners’ courage will encourage more people to help stop the persecution. Cristian Dan Preda, a member of the human rights committee of the EP from Romania, admires Falun Gong practitioners’ courage. Preda was one of the sponsors who proposed the EP resolution in December 2013 that condemns forced organ harvesting in China. Stefan Eck, a member of the EP from Germany, believes that the persecution of Falun Gong is inhuman and is a threat to world peace. He also pointed out that the persecution policies have been extended to other countries via political and economic channels since 1999. (Minghui.org) “I want to sign!” These words were heard repeatedly from people from around the world visiting Weil am Rhein, a city seated in the border triangle between Germany, France and Switzerland. The occasion was a November 14 signature drive organized by Falun Gong practitioners to call for an end to the brutal state-sanctioned forced organ harvesting of persecuted Falun Gong practitioners and to support practitioners’ lawsuits against former Chinese leader Jiang Zemin for his leading role in the persecution of Falun Gong. From the end of May through November 2015, more than 196,000 Falun Gong practitioners and their families have filed criminal complaints against Jiang. These lawsuits are finding strong support worldwide. More than 770,000 signatures have been collected between July and the end of October in Asian countries to support the lawsuits and people in America and Europe have also joined the effort to bring Jiang to justice. Many people in Weil am Rhein were sadden by the brutality of the persecution. Mr. Sommer told a Falun Gong practitioner that he was no stranger to the Communist Party’s way of doing things because his uncle’s family lived in East Germany before the fall of Berlin Wall. But he had never heard of the Chinese Communist Party’s harvesting organs from living people. “It’s unacceptable to anyone!” he said. Another passer-by, Ms. Schreiber said that it’s a matter of urgency to stop such demonic acts by posting the petitions on social media and translating them into multiple languages so that people from around the world will be able to sign them quickly. A large number of people signed the petition on November 14 and agreed that the organ harvesting must be exposed and immediately stopped. They also said that they would continue to pay attention to the progress of the lawsuits against Jiang.